In the second millennium b.c., Babylonian scribes assembled a vast collection of astrological omens, believed to be signs from the gods concerning the kingdom's political, military, and agricultural fortunes. The importance of these omens was such that from the eighth or seventh until the first century, the scribes observed the heavens nightly and recorded the dates and locations of ominous phenomena of the moon and planets in relation to stars and constellations. The observations were arranged in monthly reports along with notable events and prices of agricultural commodities, the object being to find correlations between phenomena in the heavens and conditions on earth. These collections of omens and observations form the first empirical science of antiquity and were the basis of the first mathematical science, astronomy. For it was discovered that planetary phenomena, although irregular and sometimes concealed by bad weather, recur in limited periods within cycles in which they are repeated on nearly the same dates and in nearly the same locations. 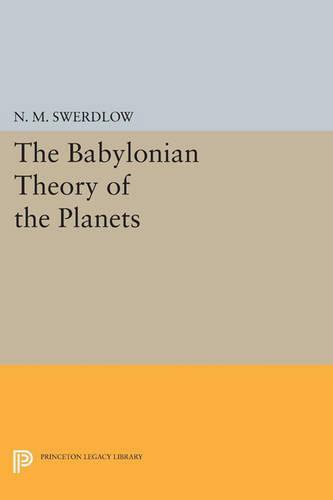 N. M. Swerdlow's book is a study of the collection and observation of ominous celestial phenomena and of how intervals of time, locations by zodiacal sign, and cycles in which the phenomena recur were used to reduce them to purely arithmetical computation, thereby surmounting the greatest obstacle to observation, bad weather. The work marks a striking advance in our understanding of both the origin of scientific astronomy and the astrological divination through which the kingdoms of ancient Mesopotamia were governed. Originally published in 1998. The Princeton Legacy Library uses the latest print-on-demand technology to again make available previously out-of-print books from the distinguished backlist of Princeton University Press. These editions preserve the original texts of these important books while presenting them in durable paperback and hardcover editions. The goal of the Princeton Legacy Library is to vastly increase access to the rich scholarly heritage found in the thousands of books published by Princeton University Press since its founding in 1905.